Do You Have Too Many Competing Priorities? The new year. It's a time for fresh starts and new beginnings. It's a time for plans...and priorities. If you're like most people, you probably feel like you have too many things to do. And you wonder how you'll get them all done. There's no doubt that most nonprofit employees are charged with doing a lot of different tasks. And almost always with limited resources. So, I ask you: What's your organization's single most important priority for 2016? What if you focused your time, energy and resources on a single priority? 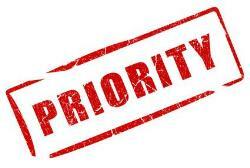 "The word 'priority' came into the English language in the 1400s. It was singular. It meant the very first or prior thing. It stayed singular for the next five hundred years. Only in the 1900s did we pluralize the term and start talking about priorities. Illogically, we reasoned that by changing the word we could bend reality. Somehow we would now be able to have multiple 'first' things." I've talked to nonprofits whose 2016 wish lists are longer than Santa's list of all the good little boys and girls last month. They want this to be the year they take their websites, social media platforms and donor communications to a new level. They want to experiment with crowdfunding. And Giving Days. They know mobile giving is on the rise. They know there's opportunity in monthly giving, too. They know donor retention is important, and they want to be sure to attract new donors as well. There's no question about it: it's all important. The more important question is, is it all doable? Short answer? No. So ask yourself: what's most important? With that answer, you can focus on doing the most important thing. And doing it exceedingly well. How do you stop doing it all and focus on the most important thing? I can hear some of you saying, "Yes, but my board [or my executive director] expects me to do X and Y and Z... and it's all important." Remember this: identifying your organization's "most important thing" starts with your leadership. Your board of directors is responsible for setting the mission and the vision. Your executive director is responsible for seeing these through. The board (often with input from the executive director) creates the strategic plan, and the staff executes the plan. That's why it's critical for everyone to understand what the "most important thing" is for your organization this year. With this newfound clarity, it's much easier to distinguish between what McKeown calls "the trivial many" activities and "the vital few." And when you focus on doing "the vital few" activities, you'll be laser-focused on what you need to do to achieve your organization's top-level goal. One of McKeown's tenets of Essentialism is this: "I can do anything, but not everything." Likewise, your nonprofit can do anything. But not everything. So, focus on the most important thing. That might sound incredibly easy. And it might sound impossibly hard. Either way, it sounds like a good New Year's Resolution to me. A lot of people make personal resolutions to kick off the new year. What about work resolutions? Does your organization make New Year's Resolutions? Check out these nonprofit resolutions and suggestions for the new year. Nonprofit consultant and coach Susan Detwiler offers this open letter to your board of directors. Read Susan's New Year's Resolution for a Nonprofit President. Nonprofit communications expert Kivi Leroux Miller shared her 2016 work resolution: No net growth of the to-do list. Read Kivi's post: 7 Ways to Say No Without Actually Saying It.